Prices, especially raw materials, must come down until they are more in accord with supply and demand factors and at levels more favorable for purchasers. Inventories of raw materials and finished goods have to be reduced and in many cases even below normal amounts. Money rates must be lowered and supply of funds available for businesses must be ample. Businesses need to have no fear of being handicapped by lack of credit facilities or high rates of interest in the near future. Production must be adjusted to consumption. Purchasing power must be built through savings and strict economy. Excess liabilities as represented by items such as large broker’s loans, installment payments outstanding, borrowing by member banks from the Federal Reserve Banks have to be liquidated and brought down to a more nearly normal basis. A saner attitude of adjusting operations and policies to facts rather than relying on unjustified and unfounded hopes must be adopted. A determination to act aggressively in remedying bad or unwholesome conditions have to be replace a policy of letting affairs drift in hopes that they will right themselves. Antique knife collectors are some of the most enthusiastic knife fans. 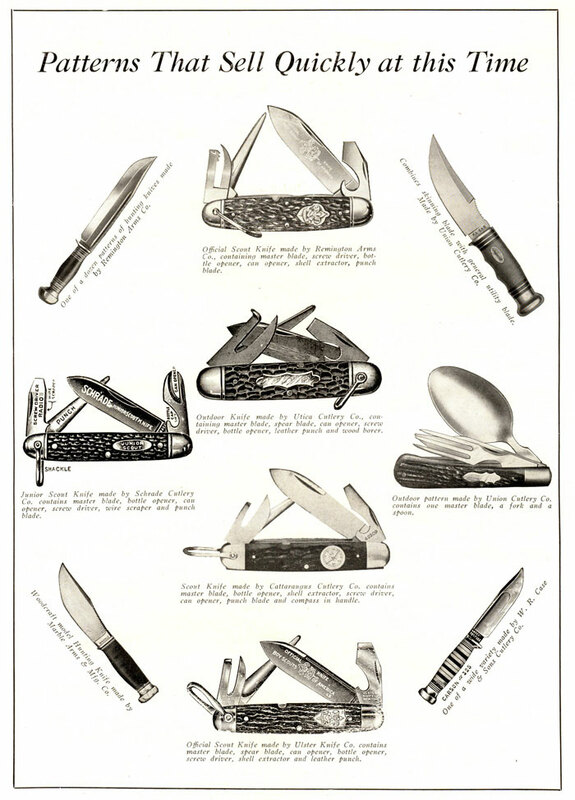 We can squeeze significance from every discovered factoid about an old knife company or pattern. We appreciate and embrace knife history, as if it were our own family’s heritage. We are simply crazy about old knives and the older the better too. Yet, antique knives have one inherent problem and we collectors can get down in the mouth about it- claiming it to be a byproduct of the modern-era we now live in with folks having access to high-tech equipment and modern knife making methods. The problem I am talking about is counterfeiting- monkeying with knives in order to cause buyers to believe they are something they are not. Contrary to what most collectors believe, counterfeiting knives is not a modern-day phenomenon. As a matter of fact, it started before many of the knives we now collect were even made. “So who are these old time counterfeiters?” Well, would it surprise you if some of the early culprits were actually American knife companies? Shocking assertion, isn’t it? 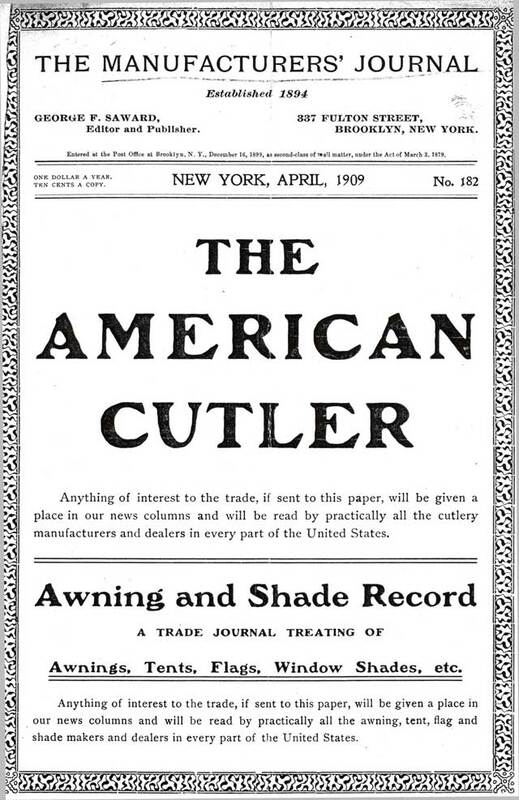 The problem got so bad, in fact, the manager of Oakman Bros. Co. of New York, a large distributor of Lamson & Goodnow, wrote a letter to the editor of The American Cutler dated March 12, 1909. So, if this report is accurate then, counterfeiting has been with for a long time. Longer, in fact, than folks have been collecting the knives themselves. Who is to say one of the knives we now call a counterfeit wasn’t “counterfeited” by the very firm we thought a modern-day counterfeiter was trying to make us believe actually made it. How ’bout that for a twist? The point here is cutlery history, albeit it dark, and also to remind us- There is nothing new under the sun. The year is 1926. Summer time is fast approaching and the local area merchant is getting ready for increasing knife sales and profits. Well it takes two to tango, so who do you think were the likely buyers back then and which patterns did they want? When we think of knife sales, we usually think of it from our perspective- that of a buyer, yet, as summer rolled around back 80 years ago, merchants clearly saw several knife patterns as the most important for increasing sales. 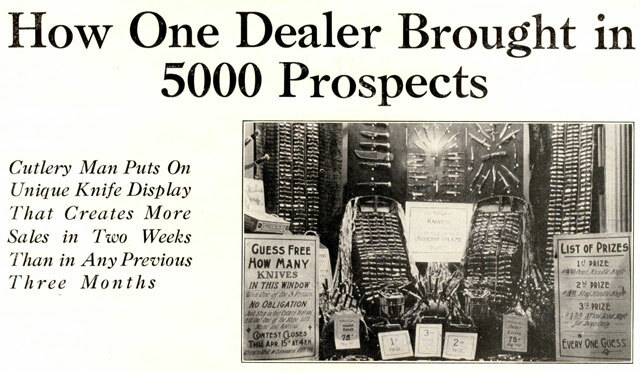 The merchants and manufacturers targeted a very definable group of buyers: boy scouts, autoists, hunters and campers. Plus they knew the patterns that would appeal to these buyers and have the highest demand- and would sale the quickest. The common denominator in all of this was- Vacations. In the summer months folks got out and about. They went camping. They took road trips. Young boys went to summer camps. All this outdoor activity directly resulted in more knives being sold. And buy they did, and thankfully so. Outdoor and Scout knives are widely collected today because manufacturers back then continued to create and satisfy the demand of the time. Being a fourth generation auctioneer and one who seeks to learn all I can about knife company history, anytime I find any information related to both of these areas, I am interested. Recently I did find a tidbit of auction and cutlery history combined. Did you know that in 1877 several of the early American Cutlery Companies joined forces to auction a large amount of cutlery? The auction was held in New York City on February 14th, 1877 and consisted of 800 lots. There was a very large attendance, including representatives of the leading houses in Boston, Philadelphia, Cincinnati, Chicago, Baltimore and even San Francisco. Listed as participating in the auction was Beaver Falls Cutlery Company, Landers, Frary & Clark, John Russell Cutlery Company, Meriden Cutlery Company, Chicago Cutlery Manufacturing Company and Lamson & Goodnow Manufacturing Company. The New York Times reported on that date that the auction prices “were extremely satisfactory, being up to current market rates” and there was discussion of making the joint auction a permanent thing. It did go on to say the auction would continue the next day. Do you think about early cutlery company and merchant knife sales promotions and how we as collectors have benefited from their efforts? If you are into American cutlery history, no doubt, you are familiar with Paine’s Cutlery Journal, but if you are not, allow me to introduce it to you. If you have an opportunity to buy or read a copy, don’t pass it up. Each edition is chocked full of interesting cutlery history. He goes further to state that there is always a latent demand for pocketknives, which awaits only the proper sales stimulus. Paine’s will “aim to awaken the dealer to the importance of featuring his cutlery department and the additional profit that is bound to result therefrom.” Paine’s clearly promoted the importance of selling cutlery and promotional efforts to help accomplish this. In this first edition there are several items of interest. One story is of a cutlery man who used a unique promotion to generate 5000 prospective knife buyers in two weeks, while far exceeding his typical sales activity. It is a story of Joseph Glick of Morristown, NY and how he designed a contest for the expressed purpose of selling more knives. The first prize winner correctly guessed the answer- 654 knives. I’ll venture to say, collectors across the US have one or more of knives bought new from innovative merchants like Mr. Glick.